MONTHLY ROUNDTABLE DISCUSSION-THURSDAY, 2/20, 6:30-8pm: This coming Thursday will be our monthly roundtable discussion/potluck, and it will be a special one indeed as we formally welcome two new members to our community: Kurt Naperschat and Alex Templeton. In addition to this, Alex will be our speaker for this roundtable. Originally from Thomasville, North Carolina, he describes himself as a traveling Catholic Worker. He interned at the Simone Weil/Peter Maurin House in Dubuque, Iowa, and most recently served a fledgling CW community he helped to form in Yuma, Arizona. The title of his presentation is: “The Future of the Catholic Worker Movement.” Please join us to welcome Kurt and Alex, and to hear Alex’s presentation. If you are able to bring a dish to share, that would be helpful, but if not, come anyway! MARK YOUR CALENDARS: SPECIAL PRESENTATION ON “SETTING BOUNDARIES” ON MARCH 27 by MARSHALL KNUDSON: The director of the Alachua County Crisis Center, Marshall Knudson, will be coming to share a special presentation on “Setting Boundaries” on Thursday, March 27 from 7-8:30pm at the Green House. All of our volunteers are strongly encouraged to attend as well as any other interested members of the community. More details to follow in future updates. Check out the facebook event page for this presentation here. COFFEE SHOPS: Monday, Tuesday and Friday mornings from 7:30-9:30 we will be having our usual coffee shops–volunteers asked to arrive at 7:15 if possible. Volunteers are also needed for cleanup from about 9:30-10:30 AM. Donations of breakfast foods such as fresh fruit, boiled eggs, baked goods, and fair trade coffee are welcome. Contact gvillecw@yahoo.com to sign up to volunteer or to bring food. DOROTHY’S CAFÉ: As usual, we will be serving a nutritious home-cooked meal in a hospitable atmosphere this Wednesday. Preparation is from 9:30-12, serving/clean-up from 12-2:30, and clean-up from 2:30-3:30. Contact us at gvillecw@yahoo.com for more information, or click here to sign up. MICROFARM MORNINGS: Come help at Black Acres Microfarm this Thursday morning from 8am-11:30 or for the monthly weekend workday this Saturday, 2/22 from 8:30-11:30. Contact Jade Allen via email (jadesallen@yahoo.com) or phone (352-337-0817) for questions &/or directions to BAM (very centrally located in the heart of Gainesville). ART-FOR-ALL: Art-for-All is meeting this Saturday from 2-4pm at the Green House. If you enjoy crafting and turning up-cycled items into something beautiful, please join them! No prior crafting experience required. Children are welcome. Roundtable this week; Dorothy’s Cafe Restarting next month! BREAKFAST: The word has been getting out about breakfasts, and we had many guests this week. We will be continuing to serve on Mondays, Tuesdays, and Fridays from 7-10am. Please keep the gifts of breakfast foods coming! We need items such as hard boiled eggs, fresh fruit, baked goods, fair trade coffee, juice, and more. Food can be dropped off the evening before each breakfast (Sunday, Monday, and Thursday evenings) from 6-8:30pm, or you can contact Daniel at daniel.loya.apd@gmail.com to arrange an alternate time. Also, Daniel is one of our most stalwart volunteers, but he recently injured himself and will not be able to help with breakfast until he is healed, so we really could use some extra volunteers. Let us know if you’re able to volunteer on a regular or one-time basis! ROUNDTABLE–THURSDAY, 10/17: We will be hosting our first roundtable of the semester from 6:30-8pm at the Green House. We will share a potluck dinner, and discuss the prologue, introduction, and first two chapters of the book All the Way to Heaven: A Theological Reflection on Dorothy Day, Peter Maurin, and the Catholic Worker. All are welcome, even if you have not read the book! One or two copies are available at the house if you would like to borrow one…and we could use some extra copies too, if you have one to lend. ART-FOR-ALL: Saturdays from 2-5pm at the Green House. The focus will be on crafting items (including home-made jam) for our upcoming open house and holiday sale. No crafting experience is necessary and all materials are provided. Children are more than welcome and will be able to work on crafts of their own. This week’s project is fabric ornaments. DOROTHY’S CAFE STARTING BACK UP IN NOVEMBER: We are planning to restart Dorothy’s Cafe on Wednesday, November 6. Prep will be 9:30-12 and serving 12-3. We are looking for volunteers, especially those who can make a regular weekly commitment. We are also looking for small groups that want to “sponsor” one individual cafe. Please contact gvillecw@yahoo.com for more information. WISH LIST: Our continued thanks to those who have been sending in gifts. Besides financial gifts, here are some of the items the Green House can use right now: towels, blankets, socks, scarfs, winter hats, any first aid stuff, and small size toiletries. Thank you so much! It was so good seeing so many of you last week as we got our full schedule under way for the semester. The GCW is a big, extended community, and we rely on you to keep doing the work we’ve committed to doing in service to and in solidarity with our friends and neighbors who are struggling because of poverty, homelessness, addiction, unemployment, mental illness and more. If you’re thinking about finding something you can commit to on a weekly or monthly basis, we hope you’ll consider helping out this semester as a regular volunteer here at the Green House–at Dorothy’s Cafe, the microfarm, Art for All, football game Saturdays, or one of our other projects. We could use your help! EXPERIENCING THE CAMINO: This past summer, GCW co-founder Kelli Brew walked the Camino de Santiago, a 500-mile pilgrimage from western France across the north of Spain and ending in Santiago de Compostela. The Camino dates back to medieval times when pilgrims would walk to Santiago de Compostela to visit the tomb of St. James, apostle to Jesus. People walk the Camino for a variety of reasons. 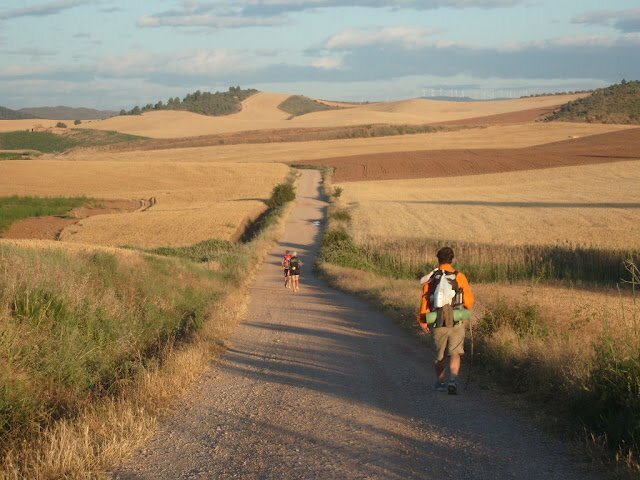 This Thursday, from 6:30-8pm, Kelli will share her experience at our first Roundtable of the semester, “Notes from the Camino.” Walking the Camino is a transformative and reflective experience, and Kelli will talk about her reasons for going on pilgrimage, share insights and stories gleaned from her 40 days walking the Camino, offer practical advice for people who may one day undertake it, and more. Join us and bring a dish to share if you can for the potluck dinner! ARTISTS AND CRAFTERS UNITE! This Saturday, from 1-4pm, we’ll host our first Art for All workshop of the semester. Former house member Kendera Omanga, along with stalwart community members Mary Peer and Linda Gardner, are organizing the Art for All workshops every other Saturday through November. Art for All is part art therapy, part cottage industry (folks needing to earn a little money who want to sell their artwork or crafts through our in-house boutique are welcome to do so) and simply creative and fun for all who participate. Local artists will be on hand to teach or advise participants as needed. Everyone is welcome to come! REMEMBERING A FRIEND AND SUPPORTER: The GCW continues to live and grow because of the generosity of so many–not only those who live close by but from friends and supporters all across the U.S. Last week, we learned that one of our most generous and encouraging supporters, Herb Bazur, had passed away at age 88. Herb, along with his wife Betty, supported our work from afar for many years (they lived in Michigan during the summer and winter in Central Florida, and recently relocated permanently to Ft. Wayne, Indiana). 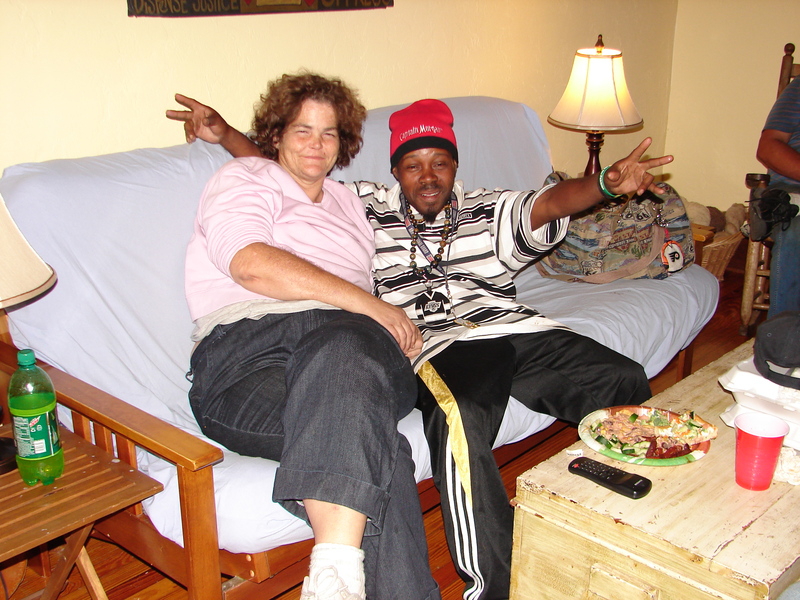 John wrote a short post on Herb on the site here for folks who want to know more about him and what he meant to our community and to John personally. Herb is survived by his wife Betty; please keep her and his entire family in your prayers. Herb was a sweet, sweet man and we will miss him something fierce. ODDS AND ENDS: No Green House Knitters on Labor Day Monday this week. The Knitters will start back up next Monday … Jade says that he can use some extra help at the microfarm on Thursday mornings, whatever time you can spare, but he’s also open to folks helping out on Tuesday mornings if that fits your schedule better. See the project page for how to get in touch with Jade and get directions to the microfarm … And our new brochure is now available! Hard copies can be found at the house and a PDF is online and can be found by clicking here. The brochure includes our schedule for the semester, contact info, project descriptions and more. Hope to see you this week at the GCW! HOUSE NEWS: Our thanks, Art for All sale, First Thursday Roundtable – this week! To see a complete list of what is happening this week, click here. Belated Thanksgiving wishes to all of you from all of us at the GCW! The great orator, William Jennings Bryan, once said: “On Thanksgiving Day, we acknowledge our dependence.” Everything we do at the GCW, we know how dependent we are on you–our volunteers, our guests and friends, our contributors. For all that you do to hold us up and encourage our work, we give thanks. We cannot do it alone; we have created a place of welcome, compassion and care, by working together. So in this post-Thanksgiving time, we say thank you–thank you for your prayers and your support, for all the notes of encouragement; for your steadfast presence at the house and in our lives; for the manner in which each of you embody compassion every day in your relationships, at work, in your families, in your places of worship, and elsewhere; for your financial support of the GCW, the donations and contributions you make, not only from your surplus but often at personal sacrifice; and finally thank you for being part of the GCW family. FIRST THURSDAY ROUNDTABLE AND POTLUCK DINNER FOCUSES ON EDUCATION: We’re excited to have Roundtable favorite Diedre Houchen with us to lead this month’s Roundtable. The topic for this month’s Roundtable is, “Limiting or Lifting: Educating our children for the world we want or the one we have?” We’ll have a broad discussion about the purpose of schooling, how that purpose is actualized in public education and current trends in educational policy. We’ll ask the question, what is the heart of education and how do we make sure we guard that vision for America’s children? Diedre is a doctoral student in education at UF, former coordinator for the youth-oriented Food and Farm Preservation Project at Florida Organic Growers, and author of the article “Uneasy Justice: Apartheid, Truth and Reconciliation in South Africa.” If you can bring a dish to share, great! Roundtable is on Thursday, from 6:30-8pm. ART FOR ALL SALE: Join us for our second “annual” holiday sale and open house! GCW members, volunteers, guests and friends from the street, under the direction of local artists and crafters, have created a variety of beautiful and unique artwork and crafts this fall. Part art therapy, part cottage industry, part celebration of creativity and community–the process and results have been enjoyed by everyone involved. The creations are eclectic and employ skill, attention and creativity to transform used, everyday items into something beautiful and useful. All proceeds go to support the Gainesville Catholic Worker and participating artists. These items make great holiday gifts while supporting the dignity and creativity of the artists and crafters. The sale will take place on Saturday, December 3 and Sunday, December 4, from 1-5pm both days at the Green House of the Gainesville Catholic Worker, 218 NW 2nd Avenue. Please help us advertise the sale by spreading the word, inviting your family and friends to come, forwarding this email, posting on Facebook, etc. If you want to help at the sale and open house, let us know! We especially need help with donations of light, Christmas-style finger foods for the sale/open house. Let Kelli know if you can help out by emailing her at gvillecw@yahoo.com. BREAKFAST BRIGADE HELP: We don’t have anyone signed up to help this week at the Breakfast Brigade on Friday, 4:15-7am. Let us know if you can make it and help out! We’re very excited to announce our Roundtable for October! Roundtables are happening on the first Thursday of each month this semester, from 6:30-8pm, and include a potluck dinner. University of Florida professor Whitney Sanford and gradate student in religion Vickie Machado will be co-leading a roundtable discussion on “Mindful Living”, Thursday, October 6th at the Gainesville Catholic Worker House. They will lead the conversation with Dr. Sanford’s current work with Gandhian intentional communities as well as Vickie’s summer experience with the environmental faith group, EcoStewards. Look for more information o our website in the weeks leading up to the Roundtable. Please bring a dish to share if you are able. HOUSE NEWS: Cafe starts, Crane Project report, and schedule ramps up! To see what is happening this week, click here. We had a very nice start to the semester with over 20 of us gathering on Thursday night for the start of the semester prayer service, welcoming of our new live-in community members, and a delicious potluck meal! Thanks to all who were able to attend. PEACE CRANE PROJECT: We also wanted to share with you a report about the guerrilla art project we did in August, with over 50 people chipping in to make it happen. From August 6-9, we hung origami peace cranes at various locations around downtown, with the message attached to each crane: “This is our cry. This is our prayer. Peace in the world.” For a full report on the project, some photos showing where the 1,000 cranes were hung, and links to news stories by the Gainesville Sun, TV20 and other media, click here. JUSTFAITH AT THE GCW: If you’ve always wanted to explore more deeply how integrated our faith is with working for justice in the world, this might be the program you have been looking for! Catholic Charities sponsors the JustFaith program in Gainesville and we’re thrilled to be hosting it this year at the GCW. It is an intensive formation program, meeting 30 times over the course of 8-9 months (between September and May), but everyone we know who has participated has found it to be an extraordinary and transformative experience. If you think you might be interested and want to learn more, we’re having 2 informational sessions: this week on Tuesday, August 30 from 7-7:45pm at the house; and again next Tuesday, Sept. 6 same time at the house. The program will start in mid-September! Contact Johnny at gvillecw@yahoo.com if you want to learn more or come to one of the information sessions! DOROTHY’S FARMERS MARKET CAFE: The cafe starts back up this week, Wednesday, August 31! We’re in need of volunteers! Come help out with prep between 9:30-11:45am, serving from 12-3pm, or clean up from 2:30-4pm. And if you’re interested in learning how to be one of the cafe chefs, let Kelli know. Each semester Kelli works with 2-3 cafe chefs-in-training, helping train folks in preparing and cooking local, seasonal foods for our guests at the cafe. Let us know if you can volunteer this week or if you’re interested in becoming one of our chefs-in-training! Email us at gvillecw@yahoo.com. ROUNDTABLE ON THE TENTH ANNIVERSARY OF 9/11: Our topic for our first Thursday Roundtable will be the tenth anniversary of 9/11 and an exploration of what has happened in our nation and around the world in the wake of the events of that day. We’ll share a resource from Colleen Kelly, a member of September 11th Families for Peaceful Tomorrows, who lost her brother Bill on 9/11. Johnny will lead us in a discussion about how our nation responded, what could we have done differently, and where do we go from here. Bring a dish to share for the potluck meal if you can! NOTE: We’re only doing Roundtables once-a-month this semester, on the first Thursday of each month. The time has shifted a little too: we’ll be beginning at 6:30 and ending at 8pm. ART FOR ALL HELP: The Art for All Project will be starting up again in September, and we need your help. Last year’s project was a great success, bringing together a diverse group of professional and amateur artists from all ages and backgrounds to produce some beautiful work, a lot of which was sold at end-of-the-semester Art Sales to benefit both the artists and the work of the House. To find out more about the project, our plans for this semester and how you can help, click here. BREAKFAST BRIGADE VOLUNTEERS: Brigade got started last week with only live-in house members doing it. It would be great to have 2-4 extra volunteers each Friday if possible. If you’re interested, email us at gvillecw@yahoo.com and let us know. We can add you to the schedule for this week or reserve you a spot on any Brigade you want to do throughout the semester! Scott Robertson’s roundtable discussion on “Radical Solutions to Feed the World” was a wonderful gathering of folks looking at very practical issues regarding sustainability in the context of “values.” “How do we do the right thing as individuals? How do we help each other get to where we need to be for the good of those who come after us and for creation itself? These two questions are intertwined when we talk about issues that affect us globally. And so they become “spiritual” questions themselves, concerned with value, meaning, responsibility, and hope. It was a good conversation that we hope to continue soon. In the meantime, Scott sent those present a handy resource list of inspirational and practical websites and books. Take a look and keep in touch. We’re looking forward to our next roundtable on this subject. You’re invited to tonight’s Roundtable, 6-7:30! Diedre Houchen and Miriam Elliot will be leading a discussion on “Dismantling Racism.” The’ll offer a working definition for racism and then describe the process used by the City of Gainesville in their current anti-racism efforts. In addition to addressing the question of whether this work is needed in Gainesville, we’ll also discuss experiences pertaining to race through the eyes of those present – and question what stories are necessary but not represented at the table. We’ll be serving black beans and rice with peach salsa. Please bring a dish to share if you can. If you can’t, come anyway! It took some extra discernment this time around to figure out how to proceed while taking into account work schedules and a limited budget. But proceed we are, to the best of our ability, and with great hope that this semester will be a good one for all who come to the house. As always we try to match the skills, resources, and passions of folks who have those to give with the needs of impoverished people in the community. Our highest hope for the house is that it will be a “meeting place” for people who might not otherwise get to know each other – a place that is comforting, challenging, interesting and engaging. For those of you who have been active in the past, you will notice a few big changes in the schedule. The most painful change for us was to eliminate the venerable, ten-year old Breakfast Brigade. While this has been a wonderful connection with folks who work at the labor pools and a fun way to gather together in the wee hours to bake bread and share it with some very appreciative folks, it is very draining of resources, both financial and leadership-wise. That, in combination with the fact that day labor itself is dwindling due to changes in the economy, make this a project that we’ve decided to end in order to free up time, energy, and resources for other projects. The Café will continue but move to Monday in order to keep fresh the veggies we get from the Farmers Market on Saturday. The logistics of finding cool storage for the abundant produce was daunting; this will help a lot. In addition, we are going to shorten the actual serving time to 12-2. We are also hoping to make the preparation time an actual opportunity for people to learn to bake bread and prepare soup and other dishes from local food. To that end, we are asking for four people to sign up for a four week stint of food preparation, at the end of which we hope you might feel confident enough to take a leadership role at a future cafe :-). To sign up for the month of September, just shoot Kelli and email: gvillecw[at]yahoo[dot]com. Servers and clean-up help can sign up on a weekly basis as usual. On Tuesday afternoons, Kendera will host an Art Workshop from 1-5. Local artists will teach participants how to create beautiful items from recycled materials. Participants will be invited to sell their creations at the house on consignment if they wish. A portion of the proceeds will go toward helping support the house, and a portion to the creator. The Roundtable and Potluck Dinner will continue as a weekly event. We have some ideas for speakers and plan to have a monthly mass as well. There will also be some dinners that will simply be a chance to share a meal and discuss a timely topic. We will let you what’s planned on a weekly basis by email. Saturday will be a day for group projects like hosting football game parties (when there is a Gator games on a channel we get) , gardening projects, and food projects like preparing produce for Monday’s café, canning and freezing excess, and distributing anything we can’t use to folks who need it. Monthly we will host a Knitting Circle at the house – 1st Monday (this Monday!) –for folks who know how to knit or crochet and for those who have skills to share. Come work on your own project or knit warm things for folks who will be out in the cold in the winter. We have some scrap yarn for practicing (or for hats and scarves), but you will need to bring your own needles. Crocheters welcome too! Take a look at our general weekly schedule at the bottom of this page for an idea of how things will go from week to week. Most importantly, check out the “This Week” tab for specifics on this week of new projects and old, including Dorothy’s Cafe, the first Knitting Circle, the first Art Workshop, a Roundtable on our community’s response to September 11 anniversary, and Community Gardening. We are looking forward to seeing you this semester!